The new Tablet PC combines the latest incarnation of previous notebook computing technologies (i.e., digital ink and voice commands) with the power and reliability of Windows® XP, possibly making it the most versatile PC ever. 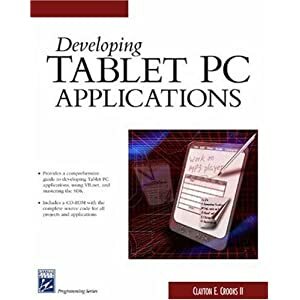 Developing Tablet PC Applications teaches programmers how to create applications for this exciting new platform using the SDK developed for it. It begins by explaining how to install and use the SDK, and then delves into the creation of several specific applications, such as a drawing program, an MP3 player, and a signature recognition program. It also covers game-related topics.